Photo of Forster's tern (Sterna forsteri) while hunting. Forster's terns are among the most at-risk wildlife species to mercury toxicity in western North America. Photo Credit: Joshua Ackerman, USGS. 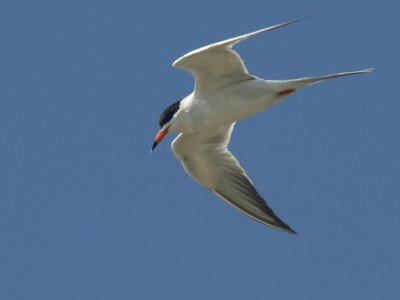 Body symmetry of Forster's terns (Sterna forsteri) in San Francisco Bay was related to blood and feather mercury concentrations. Body asymmetry can affect a bird's fitness by reducing flight efficiency, thus increasing energetic costs (especially during migration) and interrupting normal feeding and breeding behaviors. Mercury is a widespread global contaminant, and when converted to its organic form (methylmercury) it biomagnifies through food webs. As a result, top predators and species that forage in habitats favorable to methylmercury production, such as estuaries, are at particular risk to mercury exposure. The toxicological effects of exposure manifest in numerous endpoints that can influence a bird's survival or reproduction. One effect, variation in birds' body symmetry – also known as fluctuating asymmetry, can be an indicator of developmental problems in response to a variety of stressors, including contaminants in the environment. Scientists determined whether mercury exposure in four waterbird species from San Francisco Bay, California, was related with indices of fluctuating asymmetry. San Francisco Bay has elevated concentrations of mercury in water and sediment, as well as fish and estuarine birds. U.S. Geological Survey (USGS) researchers measured five paired morphometric features, such as wing length and primary feather length) and determined the relation between the morphometric features and mercury concentrations in whole blood or breast feathers. Forster's terns (which have the highest mercury concentrations in the Bay) had the highest asymmetry index (the most asymmetric) across the four species tested. Fluctuating asymmetry increased with total mercury concentrations in whole blood and breast feathers of Forster's terns, but there was no relationship between measures of fluctuating asymmetry and total mercury concentrations in the three other species (American avocets (Recurvirostra americana), black-necked stilts (Himantopus mexicanus), and Caspian terns (Hydroprogne caspia). The results of this study indicate that mercury contamination may act as an environmental stressor during development and feather growth, contributing to fluctuating asymmetry of some species of highly contaminated waterbirds, particularly Forster's terns (Sterna forsteri). There are unanswered questions about the mechanism by which mercury influences fluctuating asymmetry, as well as how asymmetry influences the survival of birds. These unanswered questions are potential next steps for understanding the actual adverse health effects of mercury exposure on water birds. Fluctuating asymmetry due to mercury exposure may add an additional environmental stressor during the birds' development, potentially affecting their ability to fly efficiently and thus influencing normal feeding, and reproductive behaviors. This study was funded by the USGS Contaminant Biology and Wildlife: Terrestrial and Endangered Resources/A> Programs, and CALFED Ecosystem Restoration Program. Herring, G., Eagles-Smith, C.A., and Ackerman, J.T., 2017, Mercury exposure may influence fluctuating asymmetry in waterbirds: Environmental Toxicology and Chemistry, v. 36, no. 6, p. 1599-1605, doi:10.1002/etc.3688. Herring, G., Eagles-Smith, C.A., and Ackerman, J.T., 2016, Fluctuating asymmetry in waterbirds in relation to mercury exposure: U. S. Geological Survey Data Release.